A couple of days ago, we came up to the barn in the morning to find Valentine in the aisle, happily munching hay from the three bales he’d pulled off of the stack. Bill immediately took the blame for forgetting to latch Valentine’s stall door, since he was the one who had put him in there and closed the door behind him the night before. This would be the third time one of us has forgotten to latch a stall door – once before for Valentine, and once for Moonshine. Heck, those things happen, though you try very hard to be conscientious about it. 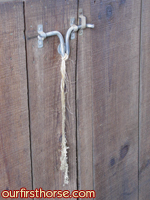 Well, this morning I was letting Valentine out when I noticed that the rope I had tied to his stall latch to tie it open (it doesn’t have a chain affixed to the door for that yet – we just started using that stall) was all matted and nasty. I thought, “what the heck has been jumping up here to chew on this thing?” Then I realized that most likely nothing was jumping up, but rather something was leaning down: Valentine. I showed Bill, who agreed, and further theorized that since the rope was tied to the latch…and a horse was pulling on it…that if he pulled it the right way, he would slide that latch right out. Suddenly the earlier escape didn’t seem to be so easily pinned on Bill. I took the rope off. We’re Still Here – And It’s Still Cold.